Microcurrent therapy has been used on equines for twenty-plus years with thousands of horses treated with great success. Used for treating horses with conditions such as sore muscles, tendon and ligaments injuries, abscesses, laminitis, paralysis, confounding lameness problems, TMJ, and neurological problems to name a few. 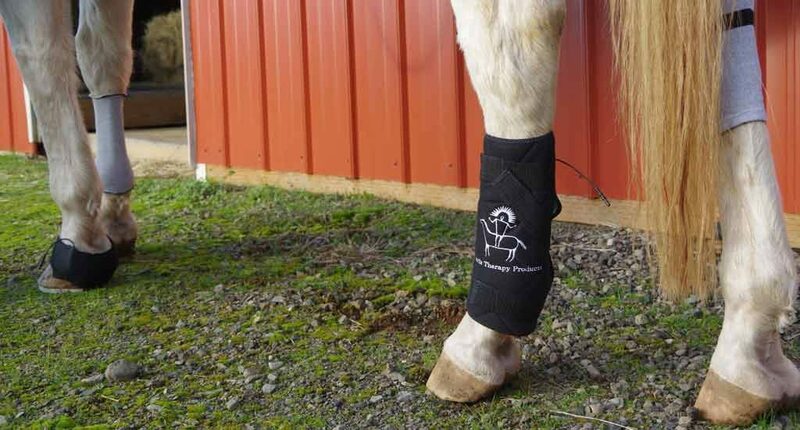 In many cases, microcurrent therapy is able to considerably reduce a horse’s recovery time. The beginnings of the modern day microcurrent started with Thomas Wing D.C., N.D., L.Ac. a fifth generation Chinese doctor and amateur ham radio operator wanting to improve on a Japanese instrument used to read and treat acupuncture points. Existing units in the treat mode could be irritating and could burn the skin. By the early 70’s Dr. Wing introduced the Accu-O-Matic, which stood for accuracy and automatic. It was a “hit” as a point reading, needle-free acupuncture instrument. In 1978 the FDA ruled that acupuncture had not been proven “safe and effective.” Production and marketing had to be ceased. Next, by removing the reading portion of the unit and not referring to it as a acupuncture instrument but for the treatment of muscles (muscle reeducation) in 1980 the My-O-Matic was released under the 1976 Medical Device and Cosmetology Act as a muscle stimulator. Because of its facial toning and wrinkle reduction abilities it entered the cosmetology industry world wide as a beauty enhancer. By the early 80’s acupuncture was being reaccepted and the “all in one units” emerged on the market with more improvements and better quality and pricing. The instruments were again reclassified and put under the TENS (Transcutaneous Electrical Nero Stimulators) class because they did not actually contract the muscle. During this time with new technology the mini microcurrent units emerged in full force by many new manufacturers many of which were already making other electrical therapy devices like the TENS. A microcurrent stimulator is very different in principal compared to other electrical stimulation devices. Microamperage units were manufactured to emulate the ranges close to the current produced by the body (human or animal). This range is 10 uA to 600 uA (microamperes) or 1/1000th of a milliampere, or 1/1,000,000th of an amp. This is a very tiny amount of current! The work compiled in a book, The Body Electric by Robert O. Becker M.D., is a compilation of thirty years of his work. As a orthopedic surgeon turned researcher, anyone bent on the desire for clinical documentation will find this an excellent resource from which to start. With the experiments on salamander and frog regeneration, the work proved ‘Electricity Triggered Healing’. Microamp stimulation has been called bio stimulation or bio electric therapy because of its ability to stimulate cellular physiology and growth processes. Dr. Becker makes the point clearly that most doctors are trained in biology but seldom make the link to the fact that first, we are a complete electrical system. Secondly and most importantly, is the understanding that if the electrical system fails everything fails. Dr. Bjorn Nordenstrom, a respected physician and researcher in the 50’s, pioneered a series of remarkable innovations in clinical radiology that were considered radical at the time and are seldom employed at hospitals. In 1985, he served as chairman of Karolinska’s Nobel Assembly, which chooses the laureates in medicine. Recognized as a brilliant, very innovative, very imaginative scientist. Dr. Bjorn has made significant contributions to radiology and medicine. In 1983 Nordenstrom published his two decades of experimental work. As Nordenstrom describes his body electric, the circuits are switched on by an injury, an infection, or a tumors or even by the normal activity of the body’s organs. Voltages build and fluctuate, electric currents course through arteries and veins and across capillary walls drawing white blood cells and metabolic compounds into and out of surrounding tissues. This electrical system says Nordentrom, works to balance the activity of internal organs and in the case of injuries, represents the very foundation of the healing process. First and foremost all microcurrent units are generators of micro amperage which is one millionth of an amp. They have wires (cables) that connect to electrodes that are attached or held to the body. Then current, microamperage (ua), is adjusted to comfort or just below being felt. Most operate on DC (direct current) using batteries that are replaced or recharged. Next, the units offer a range of low frequencies, Hertz (Hz), and controls of polarity referred to as biphasic (equal amounts of positive and negative) or positive only or negative only. Almost all are now using a square wave envelope in a variations of a 2.5 second pulse train. Timers are also standard allowing for continuous treatment or a set duration with automatic shutoff. Some units allow you to adjust the wave form slightly. Many full-featured, all-in-one, clinic-style units use GSR (galvanic skin response) to read the level of conductivity between two points. This is referred to as the diagnostics feature. This can help determine in which areas of the body that are low in electrical activity such as in a cold chronic condition or over firing or highly charged in a acute or inflamed area. As you find these areas you can in an instant treat by using electrical stimulation to restore the normal balance of electrical activity at the cellular level. The one and two channel miniature units have the same capabilities of the clinic units without feed back (GSR readings) and do a fine job. Who is Doing The Treatments On Horses? I have found the “do it your selfers” like myself are probably the largest group treating horses with microcurrent therapy. We like taking responsibility for the our health and that of our animals (microcurrent can help more than just horses). The skills required to use microcurrent are no more complicated than handing a non horse person a horse to “tack up.” It just takes a bit of practice! If you have an injured horse and want to hire a professional for treatment you can find a few Equine Re-hab facilities, Holistic DVMs, and an occasionally Large and Small animal vets that offer microcurrent treatments. There are also people calling themselves Accuscope Therapists. Finally, there are a few independent, very knowledge equine practitioners offering their services using combinations of body work and many other modalities including microcurrent. There are not really special requirements for treating horses with microcurrent. The more full feature “clinic units” are very nice. Features include: 1,000 frequencies and a wide range of current choices from 20 – 500+ micro amps, feedback (galvanic skin resistance readings) and polarity controls which will allow you to have more treatment options. Preset or programs are good and having at least two channels is best. In the mini unit category, read the specs carefully. They will have a +/- range of 20% or so. Most of the units we’ve bench checked, run on the low side. For example; choosing 100 micro amps delivers aprox. 80 micro amps. This is not a problem just be aware of this. Some units really are not microcurrent units, but tuned down milli amp units, closer to a TENS unit. Remember TENS (milli amperage- Ma) is for temporary pain relief. There’s not an over abundance of choices on the market, but there are enough to fit most peoples budgets and treatment styles. A few instruments are being marketed exclusively for the equine use like the Therascope (promoted to veterinarians) and the Leg Saver. Some units claim to be especially calibrated for equines. There is no logical reasoning for this statement, and is used as a marketing ploy. With many of us are becoming aging baby boomers along with caring for active equine athletes or retiring companions. I think you’ll find using microcurrent to help yourself and your animals is one of the safest, most versatile modalities you can use today. I have found in my research some comments degrading microcurrent therapy. Most of this is aimed at manufacturers and promoters who make exaggerated claims. However, anyone with basic electronic knowledge can understand their concerns. Whether for or against this modality, both sides agree it is very safe. The most impressive thing about using microcurrent is its versatility. Methods include surface electrical acupuncture by stimulating acupoints, motor points, trigger points, or body work like massage. My personal favorite is myofascial release work using electrode gloves. And of course you can simply apply electrodes for unattended treatments (being close by). Horses love the gentle treatments, they literally look forward to treatment time. The effects are accumulative and horses should show improvement in one to three treatments. When deciding when and what to conditions to treat with microcurrent it is always best to have a veterinary diagnosis first, then consider how microcurrent may help. Twenty-plus years of devoted users and five years of my own personal experiences make me very comfortable in recommending microcurrent therapy. Check out the Products page to find the right option to add to your therapy toolbox! Copyright © 2002, Matrix Therapy Products Corp. All rights reserved. Reproduction in whole or in part without written permission is prohibited.